Most skylights were not built for energy efficiency. Learn how an energy-efficient skylight insert from LeafGuard by Midlands Home Solutions can reduce energy loss, while bringing more light into the space. Contact LeafGuard by Midlands Home Solutions today to schedule a free estimate for skylight installation in Nebraska & Iowa. 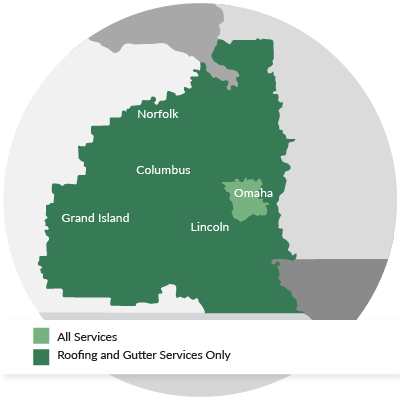 We proudly service Omaha, Lincoln, Council Bluffs, Sioux City, Bellevue, Grand Island, Kearney, Fremont, Hastings, La Vista, and all surrounding cities and towns. Avoid an energy penalty. By installing a low-e glass insert in a skylight well, you can avoid heat loss in winter and unwanted heat gain during the summer. If you want to enjoy the benefits of your skylights without enduring the discomfort they cause, LeafGuard by Midlands Home Solutions has the solution you're looking for. We install high-performance window panels along with the proper trim and weather stripping to hold the glass in place beneath skylights. In effect, you're getting a "storm window" for your skylight. Our treatment doesn't diminish the light or views coming from the skylight; it just makes the installation much more comfortable and energy efficient. The low-e coating on our glass inserts reflects heat, helping you stay warmer in winter and cooler in hot, summer weather. Don't let winter chills or excessive summer heat gain prevent you from enjoying your skylights. Call LeafGuard by Midlands Home Solutions for a free estimate on this affordable energy-saving upgrade. We are your resource for proper skylight installation throughout Nebraska & Iowa, including Council Bluffs, Lincoln, Omaha, Grand Island, Bellevue, Sioux City, Fremont, Hastings, La Vista, Kearney, and more!